Disaster is a sudden adverse or unfortunate extreme event which causes great damage to human beings as well as plants and animals. Disaster occur rapidly, instantaneously and indiscriminately. These extreme events, either natural or man-induced exceeding the tolerance magnitude within or beyond certain time limits; make adjustment difficult, result in catastrophic losses of property and income and life is paralyzed. Since independence, Malaysia has progressed and developed at an unprecedented rate and has transformed from an agrarian to an industrialised nation. Corollary to the industrialisation, disasters associated with development and technology became more apparent. Malaysia has experienced various magnitudes of disasters ranging from biological, structural collapse, fires and explosions, landslides and meteorological incidents. 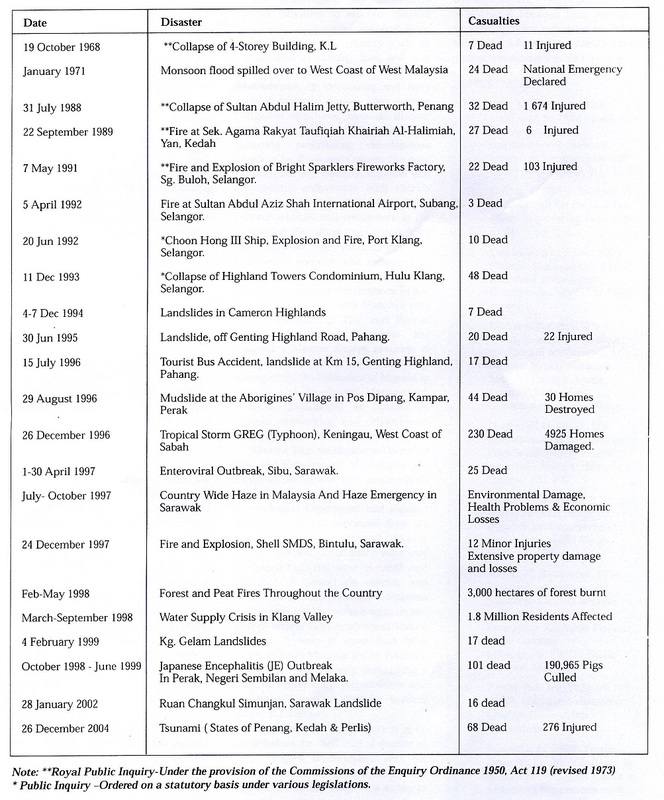 A list of notable disasters in Malaysia is shown in Table 1. The major disaster that could be linked with the development of the country was the collapse of a four-storey building in 1968. The ensuing Royal Commission of Enquiry found the then-existing Kuala Lumpur Municipal By-laws to be outdated and recommended the formulation of a uniform building By-law throughout the country in order to meet the changing needs of construction industry. The fire and explosions of Bright Sparklers Fireworks factory in Sungai Buloh, Selangor in May 1991 was one of the worst chemical disasters in the country. The tragedy and the subsequent explosion of another fireworks factory in Beranang, Selangor in 1992 resulted in the policy made by the government to ban establishment of fireworks factories in the countries. Many shortcomings on the emergency response procedures and coordination were noted during the rescue operations of the disaster. 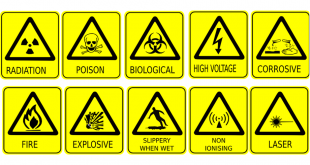 From the incident, it was realised that the emergency responders were not trained and equipped to handle disasters involving hazardous materials. Subsequently, this lead to the formation of HAZMAT team in Fire and Rescue Services Department, Malaysia. Subsequently, the whole nation was taken by surprise and stunned by the collapsed of the luxury condominium of Highland Towers on 11 December 1993. Block 1 of the three 12 storey high apartments collapsed after 10 days of continuous rainfall. After 8 days of search and rescue, 48 people were recorded dead. Following the Highland Towers incident, the noticeable lack of local expertise in specialised rescue operations led to the formation of the Special Malaysia Disaster Assistant and Rescue Team (SMART) on 1st August 1995. Under the NSC of Prime Minister’s Department, the Inland Major Disaster Management mechanism was formulated in May 1994 to coordinate all emergency agencies and handle relief activities during any major on-land disaster incident entitled the NSC Directive 20. This was subsequent to the Highland Towers tragedy as an exemplar and reference for future disasters management, where the Policy and Mechanism on National Disaster and Relief Management was formulated. In a simpler version, NSC Directive 20 means a standard operational procedure (SOP) for all departments involved in disaster management. The main purpose of the Directive is to put in place a comprehensive emergency management program which seeks to mitigate the effect of various hazards, to prepare for measures which will preserve life and minimise damage to the environment, to respond during emergencies and provide assistance and to establish a recovery system to ensure the affected community to return to normalcy. Among the types of disaster incidents that covered under the Directive 20 are; natural disasters such as floods, storms, drought, mud-slides etc; major industrial accidents such as fire and explosion; collapse of buildings, railways accidents; nuclear accidents; aviation accidents that occur on residential or build-up areas; and extensive haze condition that resulted in environmental stress and affect public order. 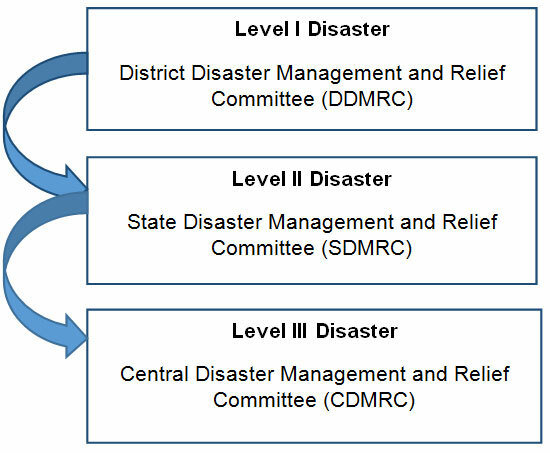 Disaster situation are often unique that demand greater coordination in multi-party context, time-constraint decision making and changes in roles and responsibilities. Malaysia’s experience with disaster management for the past 10 years has led to a need to address the disaster mitigation issues towards a better mechanism in such a manner that disaster rescue works could be performed in an efficient and effective manner. The National Security Council (NSC) is the lead agency in the federal level in charge for overall security in Malaysia, which consists of three levels, where every committee in every level has its own responsibility. In Level I, the emergency is localized where local resources are adequate to manage the disaster response. Level II is determined by a state of disaster emergency affecting more than 2 areas and require aid as well as support from outside. In Level III, disaster is more complex in nature and affect areas spanning over other states. The three levels are summarized in Figure 1. When a disaster strikes, the police department or the fire and rescue department alerts the NSC and informs other agencies such as medical department, works department, telecommunications and NGOs. Subsequently, the NSC forms a State/District Crisis Management Committee. This committee comprises central Minister, state EXCO, the NSC Secretary and district officers. The team decides on the actions and response to the disaster event. Relief centres are also established to provide temporary care to victims. A proper Disaster Victim Identification (DVI) process is as important as disaster management and coordination. DVI is a terminology used to identify individuals involved in catastrophic event of such magnitude or severity that it overwhelms the resources of the community directly affected and their capacity to cope or respond without external assistance. There is almost always a substantial loss of life as well as damage to property and loss of crops and livestock. The main aim of DVI is to correctly identify the deceased victims of a disaster or incident where there are multiple fatalities which is not a quick or easy process; or where the identity of the deceased victims is in dispute before returning them to their respective families. It is meticulous with set guidelines based on the INTERPOL standards and with legal standards that must be adhered to on behalf of the Coroner. There are range of ways a person can be identified, including visual identification by relatives or close friends, by scientific means, through circumstantial evidence or a combination of these. Matching of personal effect or personal belongings can be part of visual identification. 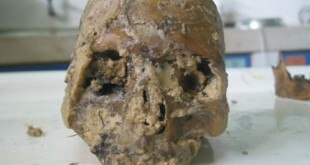 Scientific means include dental examination or Forensic Odontology, Forensic pathological examination including DNA procurement for DNA analysis and fingerprint examination on deceased. According to the INTERPOL guideline, there are four steps in the DVI process which are the scene phase, postmortem (PM) phase, antemortem (AM) phase and reconciliation phase. However, the whole DVI operation can only be successful with proper planning and coordination before the actual INTERPOL DVI process can be smoothly performed. The agency involve in DVI management need to focus in property or personal belongings management as well as to set up a Liasion Association Unit, Forensic Specialist Unit and a Recovery Unit. Finally, the Identification Commission will sit in and follow by the debriefing phase. Regional and sub-regional cooperation in the field of disaster management and preparedness in recognized as very important in the effort to reduce disaster risk and to implement effective mitigation, response and recovery measures. In this respect, Malaysia gives support to the various regional forums such as the ASEAN Committee on Disaster Management (ACDM), the ASEAN Regional Forum (ARF), the ASEAN Regional Haze Task Force as well as the Sub-Regional Fire Fighting Arrangement. Malaysia believes that regional mechanism is needed to promote exchange of information and sharing of experiences among personnel involved in disaster management in the region. Such regional cooperation is expected to contribute greatly to disaster reduction efforts and enhance national disaster management capabilities in the areas of resource mobilization, communication networks, warning systems, forecasting techniques and training. Disasters evolved from complex systems and this complexity is increasing as the world is transformed into one entity through globalisation. Disasters mutate in form, in response to population growth and urbanisation, economic growth, globalisation of commerce, technology advancement and other trends now underway worldwide. Malaysia has still a lot to learn and improve for a better disaster preparedness and disaster management system. Aini Mat Said and Fakhrul-Razi Ahmadun. Disaster Management in Malaysia : Evolution, Development and Future Challenges. JURUTERA. 2007. Badruddin Rahman. Issues of Disaster Management Preparedness : A Case Study of Directive 20 of National Security Council Malaysia. International Journal of Business and Social Science. Vol. 3(5). 2012. Disaster Victim Identification DVI Guide. INTERPOL. 2014. Magiswary Dorasamy, Murali Raman and Maniam Kaliannan. Evaluating CEMAS in Simulated Environment to Support Disaster Management Challenges. Proceedings of the 11th International ISCRAM Conference, University Park, Pennsylvania, USA. 2014. National Security Council, Department of Prime Minister, Malaysia. Directive 20 (Reviewed version). 1997.